The Congregational Holiness Church, a Pentecostal organization holding to Wesleyan doctrine, was established in 1921 as a result of a disagreement within the Pentecostal Holiness Church (PHC) over the role of medicine in divine healing. Many early Pentecostals, including PHC leaders, eschewed human remedies (such as physicians or medicine) and instead encouraged believers to seek divine healing, which they taught was provided for in Christ's atonement. This rejection of modern medicine was not universally held in the PHC. When evangelist Watson Sorrow and Hugh Bowling disagreed with the PHC on this and other issues, they were forced to leave the PHC in 1920. 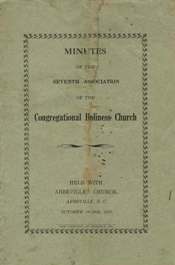 They - along with a handful of other ministers and churches - organized the CHC in High Shoals, Georgia in 1921. The CHC was organized along congregational lines, differing from the PHC's episcopal polity, in an attempt to democratize church governance. The CHC has grown from 12 churches in 1921 to over 7000 churches in 14 states and 19 countries in 2009. The CHC's growth reflects the growing importance of the emerging Pentecostal movement in non-Western contexts. Like the Assemblies of God, fewer than five percent of CHC churches and members are located in the United States. The CHC claims 25,000 adherents in 250 churches in the U.S. and almost one million adherents in about 6750 churches outside the U.S. (primarily in Central and South America). The CHC Minutes contain the actions of the General Conference (held annually, 1921-1979; biennially, 1981-2005; quadrennially, 2009- ). For more information about the CHC, visit the CHC website: www.chchurch.com.